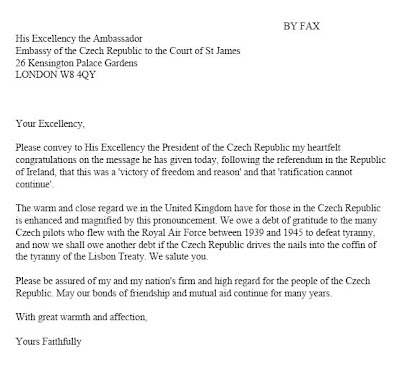 Don't let the Czechs be bullied into backing down! I am second to none in my admiration for the Devil's caustic invective, and over many years have been surrounded by feathers; feathers exploding from a rising pheasant instinctively but unwisely shot at a range of fifteen feet, feathers piling around my boots whilst I pluck chickens, geese, ducks and gamebirds, and feathers covering me warmly in bed and to lay my head upon. 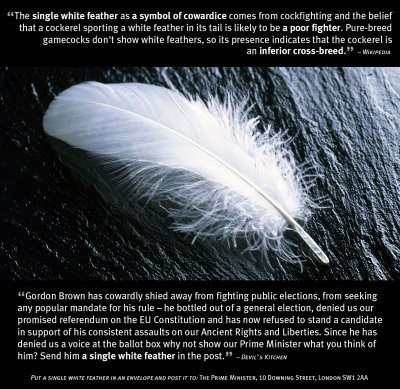 But I'm buggered if I can lay my hands on a single white chicken feather at short notice. I tried eBay. For three quid I can buy ostrich feathers, maribou feathers and goose feathers dyed in a startling variety of colours, but not a single white chicken feather on the whole of the site. My bedding is made out of goose. I could, at a pinch, lay my hands on a White Sussex cockerel this afternoon and pluck a few feathers from his breast, but then I'd have to eat him. I don't think Gordon's worth the wanton slaughter of an innocent chicken. I could, I suppose, ask the butcher - but fear he'd shake his head and demur that all his chickens come ready plucked. I could raid my tin of fly-tying supplies and find a tiny 1/2" hackle in spotted browns and greys and try to bleach it, but fear Gordon would hardly notice it. The Devil may be able to casually instruct his cook from the depths of his satanic kitchen to bring a chicken feather to his study, but I fear this is beyond my resources at this moment. My favourite fallback choice is a bag of Kelly Green Maribou feathers for 99p - do you imagine Gordon will take the point? Luke, my balanced, non-emotional, rational, non political position was formed after spending 3 years talking to people on the front line of terrorism. This includes 3 Home Secretaries, numerous police officers, ex senior police officers, security service and ex security service officers, journalists, ex jihadis, prisoners, distinguished commentators and thinkers, families, survivors, soldiers and terrorism experts from Europe and the US and UK and lawyers, religious leaders, ordinary Muslims, academics, ex diplomats, politicians of all 3 main parties including Mr Davis and Mr Clegg, and the Home Affairs Committee. I listened and learned from them all. Not all of them agree with the position I eventually took. Many, many do. I came into this with an open mind, as an ordinary person. I put aside my fear and my anger about terrorists and what they do, and of course I understand why people are afraid of terrorists. But I choose to try live in a way that demonstrates I prize freedom over fear. I will not live in a way that is terrorised and terrified; I will not do the terrorist's job for him. Your stance appears to be driven by knee jerk tribal party politics, or perhaps by fear of terrorists. I think cherishing life and liberty is more important than politics and fearfulness. My position is practical, not idealistic. I explained in my two articles, in the Sunday Times and the Guardian for example, that M16 have for the last decade battled international weapons and drugs cartels with witnesses in different continents, speaking different languages, evidence cached on hundreds of computers, their own legal and security muscle and frequently the assistance of corrupt officials. yet they not have and have not asked for 42 days. The DPP does not think it is needed, not the ex Attorney General, nor many others whose job it is to protect us and prosecute those who mean us harm. Our best intelligence comes from co-operative communities and a public who trust the police and judiciary to do their job. I would respect your decision more if you could explain why I, after all this time and energy bothering to work through all this, am still 'wrong' to cherish liberties and freedoms that protect us, that we have valued for 1000 years, and why a mess of a law whipped through for political purposes which there is no present need for, is 'right' - yet not so right that Labour can find one man or woman to stand for it and put it to the people to vote on. There are few things that eight year olds take strongly against; spinach is probably high on the list, followed by haircuts. The Act of Settlement generally figures nowhere in their list of things to be avoided. So when you see a story about a putative cub scout objecting to taking a child's promise to serve the Queen, you just know there's a gobby parent behind it. The boy himself is quoted as saying "I really enjoy the Cubs and don't want to feel left out or different to everybody else", thereby probably breaking from the script in which his mother had rehearsed him. Just leave the boy to get on with it; he's got a lifetime ahead of him to make up his own mind on such things. There can be little doubt that Davis' stance has drawn massive public support from a nation utterly sick of the apparatus of Statist authoritarian control all around us. There is no doubt that he has acted from the highest principles. It also seems likely he has blown his place on the front bench. Principles are as rare as hen's teeth in modern politics; Davis' stance would not have been remarkable a hundred years ago, and the pages of Tacitus are sprinkled with Roman senators who put death before dishonour, but the notion that a man will act not out of self-interest but out of an altruistic determination to expose this great wrong is clearly an alien one to our political class. It is no surprise this morning therefore that comment on Davis' resignation is divided, with blogs and the comment sections of the online media overwhelmingly in support but the editorials and opinions of the political class echoing Robinson's 'bonkers' comment. The political class only seem prepared to accept an MP with convictions if they are criminal ones. I think the truth is that David Davis has opened a fissure in our petrified political process, and they're not sure how to deal with it on either side of the Commons. We'll have to see how this plays out, but Davis may just prove to be the grain of sand around which will grow a pearl of inestimable price. With their oafish cries of 'Newww Surrendarhh!' the tattooed thugs of the DUP have always represented the Neanderthal wing of the Scottish nation; knuckle-dragging misfits behind whose prominent brow-ridges lies a good inch of bone. The drum is the sole musical instrument they are capable of playing; not for them the complexity of the harp. Our sole consolation is that natural selection is breeding them out of existence. Their sperm is dead, and no longer capable of fertilizing the wizened and necrose wombs of their women. Within a few decades they will disappear from history forever, and with them all their petty bigotry, spite, hate and inhumanity. Whatever 30 pieces of silver Brown used to bribe their ancient relicts with today will be soon spent, pissed on the winds of time as these Cro-Magnon throwbacks slowly self destruct. This is the sort of blog post I always tried to avoid making. Anger and alcohol. It doesn't look pretty today; boorish and nasty, and Anon in the comments has the right of it. Still, I'm going to leave it up as a reminder to myself. The Mirror carries a story that Brown's 42 days detention proposals are flawed because suspects cannot be held for that length of time either in police cells or in overcrowded high security prisons (where suspects would be in solitary confinement, no doubt). Despite Patrick Mercer's deep misgivings based on his personal experience of detention without trial in Northern Ireland, it seems the government has learned nothing. 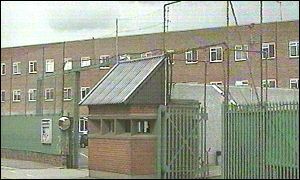 No doubt the old architect's drawings for the Castlereagh Interrogation Centre are being studied by the Home Secretary; I wouldn't be at all surprised that if this truly dreadful legislation is passed the government will see fit to build a specialist holding and interrogation centre in West Drayton or somewhere similar. DUP members will know better than most how Castlereagh was regarded in the Province. And how many lives were needlessly lost from the hatred and loathing of all it represented. Let's hope they search their hearts before they walk through Brown's lobby today. I suppose when you're a not outstandingly bright young woman on benefits and a nice friendly journalist comes calling the dangers are unforeseen. I suspect poor Karla Whiffen little guessed that when the 'Mail' featured her in a piece on affordable housing it would juxtapose her picture with photographs of a show flat considerably larger and more luxurious than her studio, captioned 'fit for a king - the kitchen and diner' and 'touch of class - the bedroom', with the suggestion for the undiscerning reader that these were pictures of Karla's flat. It is a bread and butter 'Mail' piece, written to draw the opprobrium of the nation down on the head of some helpless ninny. And ninny she certainly is. The paper quotes her as saying "When I fell pregnant I put my name down on the council housing list then eight months later this place came up. I pay £75 a week using my housing benefit which is very good. I know as Millie gets bigger we'll need to move but I don't want to - I love it here and feel very lucky." And here we have in two sentences the pernicious effects of the victim culture and the rights culture; to 'fall' pregnant as though one is the victim of an accident of circumstances wholly outside one's control, and the delusion that Karla is actually paying anything at all. Which of course she isn't. Not a penny. And not a penny in Council Tax. And so the Mail, which believes being unemployed is morally reprehensible and that single mums should be miserable, has a perfect story. But it really isn't Karla's fault, and she is undeserving of the bile that will doubtless accrue around her. If Karla had to knock on the doors of all her neighbours in their £0.5m flats each week and ask each for a quid instead of being paid by the anonymous 'social' she may be more aware of whose money she's spending, but Leviathan has disconnected the direct financial relationship between taxpayer and welfare recipient. And the capital cost of her flat has been paid for by all those in the development whose purchase price has been inflated by the developer to pay for the compulsory 'social' housing; a proportion of the monthly mortgage payment that each of them makes will be paying for Karla's flat. This is the price of planning consent, which is paid by ordinary working homeowners not by fat developers in stove-pipe hats. It's just another stealth tax. If some compassionate person actually sat Karla down and explained all this to her kindly and carefully I'm sure she's a decent young woman and would then regard her neighbours a little differently. She might even feel a responsibility to be less of a drain on their wallets and purses. Frank Field favours devolving welfare payment decisions right down to local level as far as they can go, and this is good. If a more direct link was made between taxes paid locally and welfare payments it would be even better. The Mail's readers may fulminate against Karla, but she's really the wrong target by a million miles. What's on Gordon's lavatory wall? I'd guess that Gordon Brown isn't amongst those public figures that like to display original political cartoons of themselves in their lavatories. 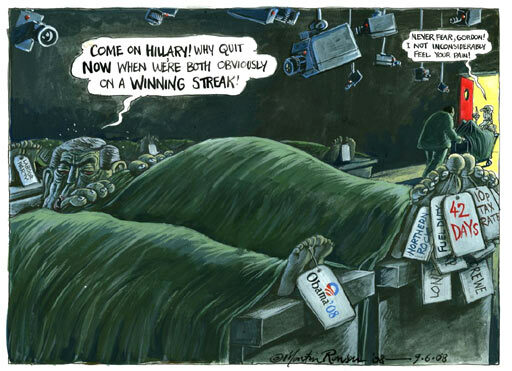 At least not those by the Guardian's Martin Rowson. John Major with his underpants worn over his trousers, and both Thatcher and Blair's single maniacal staring eye, all by Steve Bell, fixed in the public mind the human judgment of the nation and all were not bereft of a certain affection. 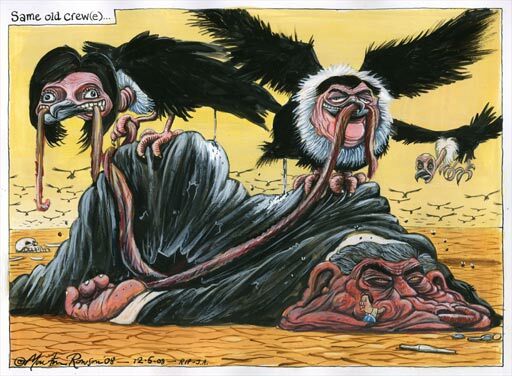 But Rowson's depictions of Brown are savage; a rotting corpse exuding the grave-stench. For a man as devoid of humour as Brown, they must be painful indeed to bear. In a typical Toynbee 'don't let the facts get in the way' piece in the Guardian today, amongst other blithering rubbish she states "Scandinavia has more single parenthood and yet far less juvenile crime. Why? Because it is inequality and poverty that trap families into generations of dysfunction." Ah. Now some 25% of 'families' in the UK are single parent - the highest in Europe. Around half of the UK's lone parents are out of work. In Finland and Denmark around 80% of lone parents have a job. We pay about £4bn a year to workless lone parents in benefits - income support in the main. In the UK single parents have no obligation to seek work until their youngest child reaches 16. The Scandinavian nations do all they can to keep single parents in work and in the labour market. So doubtless what Polly meant to say was "Scandinavia has less single parenthood and yet far less juvenile crime. Why? Because it is Welfarism that traps families into generations of dysfunction." She is right on one thing, though. Brown is an autistic zombie, unable to connect emotionally with voters, whilst Cameron's easy public manner and compassionate 'one nation' approach appeals to voters throughout the political spectrum. A welcome e-stiffie today from FOREST to join them for a civilised and smoke-friendly event at an upscale London venue to mark the first anniversary of the smoking ban. Which I will very graciously accept. I am reminded that it was February last year that I attended Lord Harris' memorial service in Smith Square; Ralph Harris was of course chairman of FOREST and there was no more zealous defender of personal freedom. Norman Tebbit warmed himself to the entire gathering when, as a lifelong non-smoker, he offered to light-up on stage in protest against the smoking ban. Bless him. Ralph Harris was fond of quoting "There's not enough darkness in the whole world to extinguish the light of a single candle". This is always a great encouragement to me; those of us who hover around the 80 unique visitors a day in the blogosphere sometimes look with disheartenment at the two big boys with their 2,000 a day or more, but it shouldn't be so. Just a single reader of this blog delights me and makes it worthwhile. So thank you, if you're reading this. And for all fellow bloggers - imagine the combined effect of the light of all our candles. Free-range people? Yep, count me in. Three stories about selfish myopic cranks are bubbling around the press at the moment. Nudist parents who scare the hell out of their kids make the running in the Mail, Whilst the Times carries the story of a weird Vegan couple who are driving their child to an early death by starvation and the Telegraph reports on a dying Jehovah's Witness being denied a blood transfusion against the wishes of his kids. All are inflicting their crankish beliefs on others and thereby causing real physical hurt or great distress. Now, I've always been 100% behind the 'Do what you will' school of thought but it has an important rider - ' so long as it does no harm to others'. Idiots such as these who proclaim their rights to the first half but forget the second need to be constrained by the rest of us. Selfishness is not a right in a free society. Melanie Reid make a plea for GM in this morning's Times, frustrated at the instincts of the British public that are preventing widespread roll-out. "Genetic modification is simply selective breeding; it has been key to farming since the first hunter gatherer decided to stay put and find a bull for his cow. ", Reid says. Not so. Selective breeding depends on nature's doorways being open; if the female stigma can receive the pollen from another plant, the genes may be mixed and a useful cultivar produced. If a bull can serve a cow from another breed, a useful hybrid with greater milk production or whatever can result. But GM modification often depends on smashing down the walls nature has erected to prevent a type of pollen, say, from reaching a plant's ovary. It is profoundly unnatural. Common sense suggests that if nature has erected a barrier to prevent cross-fertilisation, there's a good reason for it. Reid pleads over GM meat and milk that "something has to produce the protein to keep the world alive.". To a point, Lady Copper. Intensively reared beef is fed on grain; that grain does a far better job of keeping the world alive than it does fattening cattle. And she extols a freak Holstein clone that 'produces 30% more milk'. Holsteins have become freak milk machines anyway; kept in open barns where they expend little energy moving about, and fed on total mixed rations, injected with bST hormones and milked three times a day their production has already been boosted way beyond the natural. The British Fresian, a less intense version of the Holstein, is a little nearer nature but still needs indoor winter housing and grain feed to reach profitable levels of production. With grain prices through the roof, and oil likely to reach $200 a barrel before the year end, neither breed is sustainable. Nope. What we need is less laboratory GM not more; selective breeding by all natural means is the way ahead. And as for cattle, I recommend our own Anglian Red Poll. It eats grass all year round, doesn't need grain or indoor housing (will keep outdoors in rain and snow with a winter top-up of hay and silage) and works well whatever the oil price. An excellent hardy breed for milk or meat, long-lived, easy calving and good natured it was the result of natural selective breeding in the 19th century. It is ironic that not long since Peter Oborne published 'The Triumph of the Political Class' we are at a time when the political class is at its nadir. The recent rash of exposures have confirmed what the public has always known, that politicians are corrupt deceivers. Caroline Spelman, whose elegant snout has hardly tasted the trough at all, might be wondering this morning 'why me?' and perhaps reflecting 'it's not fair.' And indeed it probably isn't. Those who foolishly advocate that politics should be a 'career' as well as those who advocate that politicians should be accountable and sackable, those who say that manifestos should be enforceable in the courts and those that advocate that MPs should be triable for mendacity, and those who would have us provide professional training and qualifications for MPs are all equally responsible both for the rise of the political class and for its fall. They all, on one side or the other, want to apply the attributes of the free market to politics, but they simply don't apply. The free market works on trust, certainty and valuable consideration, and is based on contracts and free choice. One who pursues a career offers his or her skills, ability and experience to the market; the market places a value on them, and a return which is commonly financial but may be emotional (in the case of 'social care' careers) or social (status) or a mix of these is obtained. A service provider works on real and measurable contractual commitments; how much health care will I get in return for my payment, what percentage of your crammer's pupils get places at Oxford? In a free market, individuals and firms that offer the best returns in a framework of free choice and voluntary discrimination win. The free market has mechanisms for dealing with non-performance; contracts of trade and contracts of employment can be enforced or terminated. Politics has been called the art of the possible - and the possible is anything you can get enough people to believe. Success in politics is by image, coercion, influencing and manipulation. The promises of politicians are not concerned with selling what they have but with what we have; a politician can't make one person wealthier or more advantaged without making another person poorer or less advantaged. Politics relies on forced redistribution, whether of wealth or status or power (yes, I know the last two are not economic concepts). For politics to work - for a political democracy to function - politics must remain far removed from the mechanisms of a free market. When politics was clearly a choice between widely separated ideologies none of this was an issue, but the positioning of all the parties on the same centre ground and the rise of the Political Class is not coincidental. If we reduce politics to just another market exchange, we put politicians in the same class of commercial service providers as mystics and tarot readers, faith healers and crystal therapists. A manifesto promise becomes something you can complain to the Trading Standards about. A political vision becomes an undischarged contract term. We do away with elections and introduce selection processes to pick the very best of those who tender for a 'career' in politics at the best price. We sue and claim damages if they fail to effect a meeting with a metaphorical tall dark stranger. Politics is not a career. It's not a profession. It's not subject to equalities quotas or positive discrimination. All those who have sought to make it so - the Political Class - are responsible for the loathing that the public feels for politics and politicians. Very well, the public are saying, if you want it to have the attributes of a real job, let's make it so; we'll control your pay and let's control your expenses and timekeeping as well, and set you all individual annual performance targets and have the sanction of dismissing you for employment misconduct. A career is something an individual embarks on for personal betterment - financial, emotional or social; it's about getting, not giving. Unless we get back to a politics based on a desire to serve, to give rather than to get, to make personal sacrifices for the good of others, to communicate a genuine vision of a future common good and a selfless belief in abstract moral aims then we risk fracturing our very foundation of social democracy.